The Rick Ray Band surprised and delighted me with their 2008 disc, Violence Marred By Peace. The eclectic guitarist and his collective of prog rock fusion compatriots return in 2009 with The Setlist, an in-studio 'live' recording of what you might find the band playing at a club near you (if you're lucky enough to have them come your way!). As most listeners and critics in the past, I had my doubts about this lastest venture from Rick Ray. As profilic as his output is, doing a psuedo-live recording in a studio seems beneath Ray and his talents. 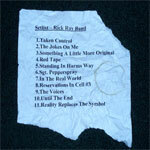 If it were not for Rick Ray's skills as a musician, song composer, and a band leader (not neglecting the fine talents of his band), I would blow off The Setlist as an excerise in punching out another album in another year for a profit. However, there is a true dynamic quality to this recording. With the exception of a poor start and a uneven mix, The Setlist is generally vibrant and enthusiastic. Even though I can not figure how a 'live' studio trumps a 'live' outside venue recording, songs like Red Tape, Sgt. Peppersray, and Reality Replaces The Symbol are lively and quinessential Rick Ray Band. Specific mention should go to the brilliant bass work of Wally Spisak, the reed work of Rick Schultz, especially on Standing In Harms Way, and Dennis Corrigan's harmonica on the same. The Rick Ray Band's The Setlist, though treading the questionable path of an studio 'live' recording, is another fine example of their inestimbable talent and creative music. Rick Ray and company remain one of America's hidden treasures of melodic prog rock fusion that you must discover today. Very recommended! The Rick Ray Band's The Setlist, though treading the questionable path of an studio 'live' recording, is another fine example of their inestimbable talent and creative music. Rick Ray and company remain one of America's hidden treasures of melodic prog rock fusion that you must discover today.